Is it possible to decorate mini apartments and flats without giving up style and comfort? Yes you can! We know some secrets that can help you when choosing main furniture and with great protagonist, as is the case of the sofa. We explain how to choose the perfect sofa considering your type of living room. And all this, without having to give up comfort and style. Take a seat and enjoy the best sofas for small spaces. The first thing to keep in mind when choosing the sofa is the color. Remember that the light colors bring luminosity, which allows gaining amplitude. While dark tones absorb light, this makes the spaces appear smaller than they actually are. So our advice is to choose a sofa in a bright color. 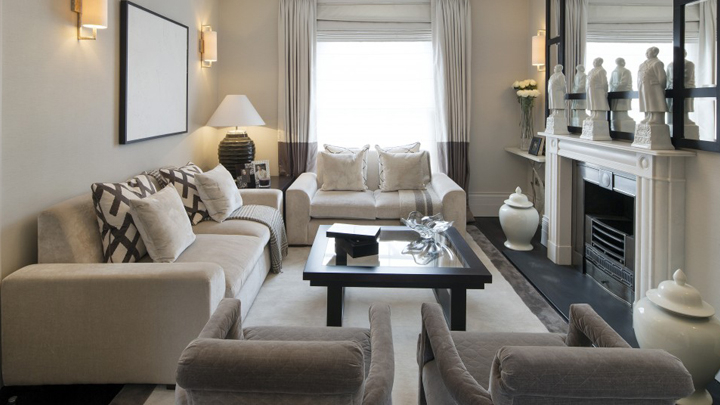 These neutral tones are the perfect base for any decor: timeless, luminous and elegant. If you want to give color and create contrasts, the cushions and plaids will be your great allies. Although there are plenty of reasons to decorate the living room with a white sofa, if you do not dare with such a clear color, nothing better than to choose the infallible gray or the warm earth tones. Although you can also put a different touch, choosing a sofa in soft tones like a dusty rose or mint green, very soft. Although these colors, being unexpected, it is advisable to introduce them in rooms decorated in a discreet way and with a chromatic palette based on neutral tones. As far as stamping is concerned, as it is about not recharging the decoration of the room, our advice is that you opt for smooth models. 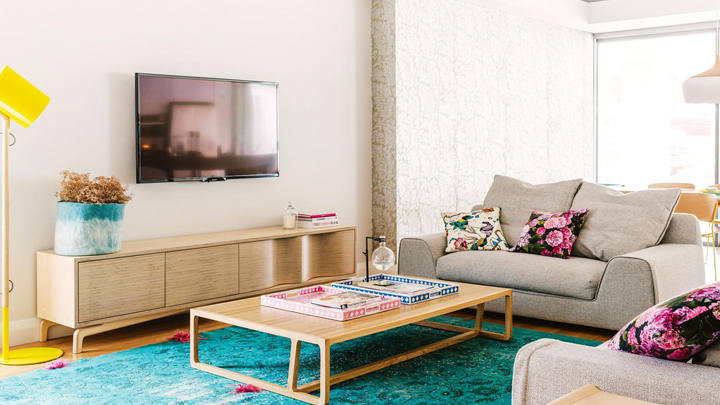 If you want to introduce some stamping to give volumes and contrasts that enrich your living room, the ideal is to opt for simple prints and neutral colors, for example, a striped pattern. If we talk about design and shapes, we recommend opting for a simple sofa to avoid recharging the decoration. As far as style is concerned, nothing better than the Scandinavian or Mid-Century sofas. With simple lines and with light legs that are slightly detached from the floor, these discreet sofas are light and very functional. In other words, they are perfect for mini halls where simple lines and sober designs predominate. Another interesting option are the sofas of curved shapes and sinuous lines that allow to soften the decoration. The rounded designs envelop us and make us feel more welcome, compared to other sofas with aggressive straight lines. Of course, another aspect of decorating a small room is the size. In this regard, we have to pay attention to the number of people we are at home and the space available in our living room. If you cannot afford a very large sofa, remember that you have many other alternatives such as complementing your sofa with an armchair, armchair or pouf. No one will be left without a seat. Also, do not give up the sofas with chaise lounge that help us to frame the room and also offer an extra seat that serves as a footrest. Although it occupies more space, its design allows to delimit the hall and offers many possibilities, both from the point of view decorative as practical. Finally, when choosing the size of the sofa, our advice is to take into account the space around this piece of furniture. It is important to reserve some space around the sofa to avoid recharging this environment. Have we forgotten some important detail?